I know that the economic climate in our country is at an all time low, but what does it say when the largest retailer in our nation puts up collection bins not for the needy residents of their community. I find this to be the most shameful thing this company has ever done… instead of paying their workers a living wage they actually have the nerve to set bins out so that their customers can take pity upon their needy employees. This company has a long history of not acting in their worker’s best interest and their wages and hours are bare minimum compensation for the work that they do. It makes me wonder what they are going to do next, put up a Christmas tree in front of the store and expect their customers to leave gifts for their underpaid employees? I am not that old and I remember a time when companies gave their employees holiday bonuses to make sure that there was food on the table (and good food at that too) for the holidays. My stepdad always brought in a ham that DuPont provided every year at Christmas time. 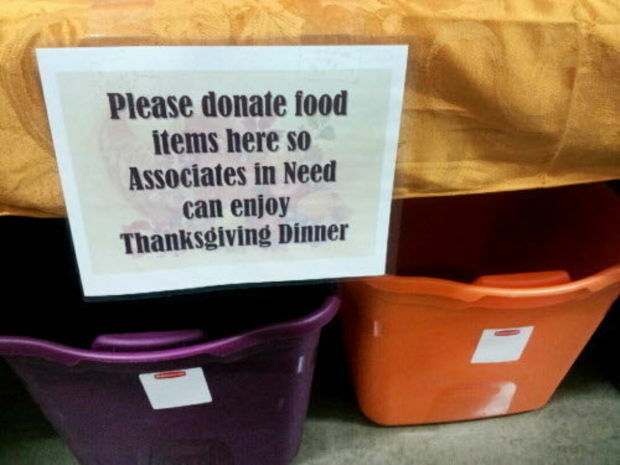 Wal-Mart can certainly afford to provide food for their needy employees, they are the most profitable retail store in the world afterall. Better yet pay them a responsible living wage so that they can afford to provide for their family year round. When Sam died they threw family values out of the boardroom window. Tricia, That would be the best solution… remember when companies cared about their employees? I worked for Wal-Mart in the 1980’s and back then when Sam Walton was alive they closed on thanksgiving… the day after and on Christmas eve early by 5pm and Christmas day. They Closed early on Sunday to give their employees time with the family. It started after he died then they had after hours stock crews come in and clean and stock the shelves… then it progressed to 24/7. I don’t know how along the way they changed so much, but it was not for the better. Personally I think that Sam Walton is turning over in his grave at what his creation has become. Zoe, I believe Wal-Mart is a truly soulless corporation. I can’t believe that they are allowed to do what they have done to our economy. That’s why I enjoy shopping Costco so much because they sell good products at a fair price and most of them are made in the USA… their food is organic and mostly produced in the USA. Every place has their imports… it’s hard to find a coffee part or a television that is still made in the USA, but hopefully with the new tax breaks to bring workers back to there will soon be some production return to our soil. Sadly I am not surprised. WM has been taking money from taxpayers for their fat corporate welfare checks & tax breaks, paying their employees so poorly they have to get food stamps (also from our taxes), then their employees spend those food stamps the only place they can afford, WAL-MART. Zoe Jackson Sylvia Bruton I am sure you guys want to know about this one. Disgusting isn’t it?